Moorhead's Bryant Christian celebrates his game-tying goal late in the second period for Moorhead (Photo by Tim Kolehmainen). 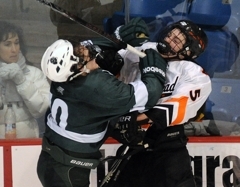 Moorhead's Tony Uglem (10) collides with a Roseau defender (Photo by Tim Kolehmainen). As the clock ticked off the final minute of the Section 8AA semifinal in Moorhead Saturday night, the Spuds’ Cody Rahman was just like any other fan. He could only watch and wait. Moorhead led by a single goal, 3-2. 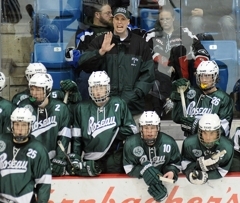 Hanging in the balance was the team’s season against its most bitter rival, Roseau. The two northwestern powers meet twice every regular season – and almost inevitably end up head-to-head in the playoffs as well. 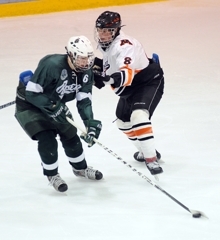 In each of the last 14 years, either Roseau or Moorhead has represented Section 8AA at state. Last year was no exception. 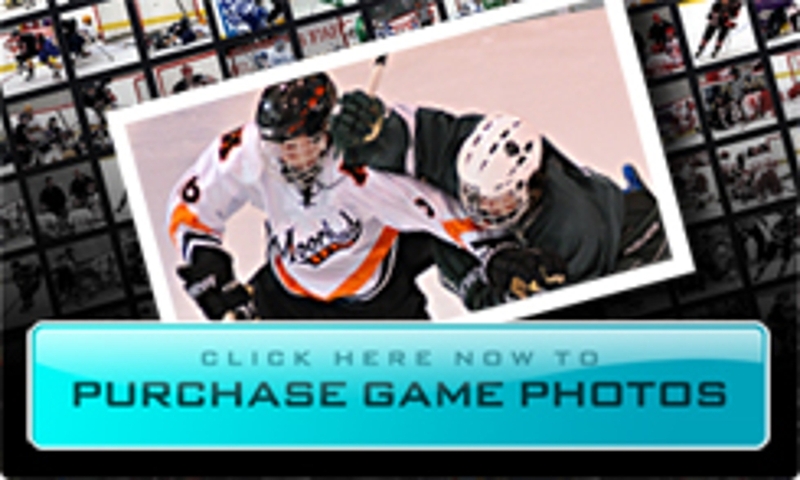 Roseau downed Moorhead in last year’s Section 8AA final – a heart-wrenching ending for the section’s top seed. Cody’s older brother Braden was a senior leader on that team and still feels the sting of that loss. Braden, now playing at nearby Concordia College, congratulated his little brother heartily when the Spuds beat Roseau 6-1 back on Jan. 25. “He doesn’t really like them too much,” laughed Cody. 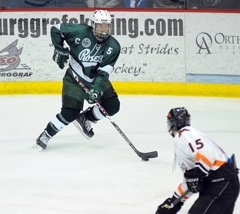 As Roseau buzzed around the Moorhead net, peppering the Spuds with point blank shots, Rahman longed to be on the ice protecting the one-goal lead. “I like to have it in my hands instead of just watching from the bench,” admitted the junior, who doesn’t play a regular shift but hits the ice when the Spuds need an offensive spark. 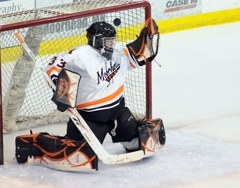 Michael Bitzer made 25 saves on 27 shots for Moorhead, but this shot by Shane Omdahl eluded him (Photo by Tim Kolehmainen). The unspoken counter in Morinville’s assessment is that Rahman’s defensive play still needs some work. Yet that the Spuds were in a position to win came straight from the hands of Rahman. Earlier in the third period, he tipped a Jacob Uglem shot from the point up and over the shoulder of Roseau goalie Jared Strand. The puck fluttered like a wounded butterfly, but dropped behind Strand and bounced across the goal line. “I was just trying to screen him and get in front of the net,” said Rahman of his fifth goal of the season. While Rahman was watching in agony on the bench to see if his goal would stand as the game-winner, junior goaltender Michael Bitzer had a front row seat for the action. For the final 1:27, Roseau was effectively on a power play after pulling Strand for an extra attacker – and the Rams spent much of that time circling the Spuds’ net like sharks around a bucket of chum. “It was probably the longest minute of my life,” said Bitzer, who saw at least five or six good scoring chances in that time from Roseau’s top line of Shane Omdahl, Josh Erickson and Travis Connell. Yet Bitzer, as he has done all season, stood tall in the Moorhead net. 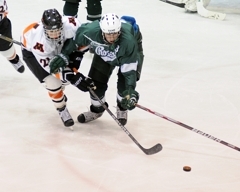 The junior stopped several point-blank, wrap-around chances – the rebounds on which were cleared by his defensemen, who tried to keep the whirling Rams’ offense to the outside and let Bitzer see the initial shot. “It’s nice to have Bitzer back there,” breathed Morinville. “He made saves when he had to.” In two playoff games, Bitzer’s save percentage has been just as strong as during the season (.930, which ranked sixth in the state). As the final horn sounded, Rahman breathed a sigh of relief. The Spuds leaped over the boards and rushed Bitzer, who finished with 25 saves on 27 shots. Jeremiah Graves made 34 saves as No. 1 Bemidji held on to beat No. 4 Brainerd in the Section 8AA semifinals at the Bemidji Community Arena Saturday night. The Warriors outshot Bemidji 35-27, including 25-15 over the final two periods. Jake White, Matt Serratore and Max Hazelton scored for Bemdiji, while Mr. Hockey finalist Josh Archibald tallied the only Brainerd goal. The top-seeded Lumberjacks will face No. 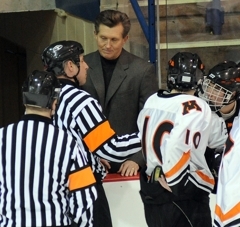 2 Moorhead in the Section 8AA final Wednesday at Ralph Engelstad Arena in Thief River Falls. 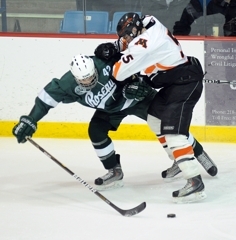 Roseau's Ryan Leverington (6) and Lyle Norman (44) get physical with a Moorhead forward (Photo by Tim Kolehmainen). Cody Rahman tipped home the game-winner 3:19 into the third period to lead No. 2 Moorhead to a 3-2 victory over No. 3 Roseau in the Section 8AA semifinals at the Moorhead Sports Center. Rahman's goal capped a rally from a 2-1 deficit for the Spuds (17-7-2). Moorhead scored the game's first goal from Logan Ness, but Roseau (13-14-0) tied it with just 14 seconds left in the first period. Josh Erickson, who missed the last meeting of the two teams due to injury, fought through a Spuds' defenseman for a breakaway goal. The late goal seemed to inspire the Rams, who outshot Moorhead in the first period, 13-3. 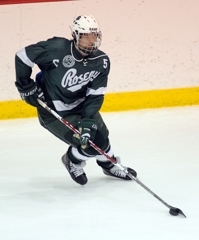 Roseau came out strong in the second and took a 2-1 lead on Shane Omdahl's goal at the 7:40 mark. A great individual effort from Moorhead's Bryant Christian tied the score at 2-all after two periods. Christian rushed the puck the length of the ice, splitting two defensemen and deking Jared Strand. Bitzer made 25 saves on 27 shots for Moorhead, while Strand stopped 21 of 24 shots for the Rams. With Strand out of the net for the final 1:27, the Rams hammered away at Bitzer, but could not dent the twine for the tying goal. Moorhead will play No. 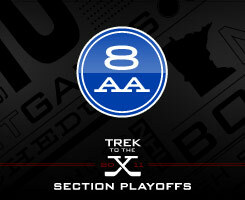 1 Bemidji in the Section 8AA finals, set for Wednesday at Ralph Engelstad Arena in Thief River Falls. The two teams played twice this winter, both ending in ties. The junior forward avenged his older brother by netting the game-winner early in the third period of Saturday's Section 8AA semifinal. Rahman, who doesn't play a regular shift, was in the right spot as he tipped in Jacob Uglem's shot from the point. Rahman's older brother Braden was a key member of Moorhead's team last winter when it lost to Roseau in the 8AA final (Braden now plays at Concordia College). The last wall of defense for the Spuds continued his All-State caliber season, stopping 25 of 27 shots, including a flurry in the final 1:27 when Roseau pulled its goaltender. Bitzer allowed virtually no rebounds all game, swallowing up the first shot and keeping the Rams from generating extended chances. 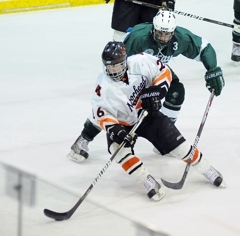 The junior forward missed the last meeting between Roseau and Moorhead, a game the Spuds won easily, 6-1. His return made a big difference Saturday night, as he used his speed and toughness to create several scoring opportunities. Erickson's goal with 14 seconds left in the first sparked the Rams. 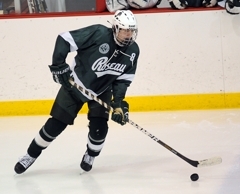 Will Hillman scored two first-period goals to help the Bengals to an early lead, which they never relinquished.